I'm going to share a bit of our experience, but please - PLEASE - don't take this information and try to do it without reading the actual book. That book explains how each Dare works, gives you the scripture to back up the activity, and is just generally the bigger picture in terms of the dare itself. For us - we've found that it's helpful for us to be on different days of the Love Dare program as well - so I am a day ahead of him. We've done days 1-5, and it has been great! Day 1 - the dare for this day is to "Resolve to demonstrate patience and to say nothing negative to your spouse all day"
I'll be honest, I didn't feel very connected to this dare because I try my best not to say anything negative to John on a regular basis. I did watch myself though for the day and if he asked me to get him something - I did it happily and without sighing. Sometimes when life gets hard - it is easy to want to retreat from everything and not be bothered to help anyone around you. I really focused on being a wife that serves with a happy heart on the first day. Day 2 - the dare for this day is "In addition to saying nothing negative, do at least one unexpected gesture as an act of kindness." I'm not sure that I did very well on this one - I tried to continue on with being a servant to my husband with a happy heart. He on the other hand did some amazing things... while I worked out - he cleaned the kitchen, started a bath for me, and watered the hibiscus plants out front. I was so grateful and amazed - I absolutely adore when John does things like this... I don't know what it is but the simplest things can mean the most to me. I mean just the bath part alone was out of the ordinary and made me feel so loved and special. The other two, really - he's done before, and they are great helpful things. Day 3 - the dare for today is "Along with restraining from negative comments, buy your spouse something that says 'I was thinking of you today'" The idea here is that whatever you invest your time, money and energy in will become more important to you. I racked my brain on this one - because really - John is a simple guy and his interests are more in terms of experiences had together and or time... he doesn't really have a lot of little things that he enjoys.... like my Starbucks habit or anything like that. So instead, I got him some boxers and the movie Flywheel - the boxers mainly because he needed them for his treatment plan... and the movie because we enjoy movies, and this was the first one done by the makers of Facing the Giants and Fireproof. He bought me the most beautiful flowers... see below. He also got us some new flowers to plant in the back yard - so look for pictures of that once we get the yard work done tomorrow. The flowers are beautiful! Day 4 - the dare for this day is "to contact your spouse at some point in the day to check on how they are doing and see if there is anything you can do for them." I royally botched this one - because this was the day that all heck broke loose at the office... so I didn't get a chance to call him most of the day, so I sent him an email asking if there was anything I could do for him. He'd already left the office to go out in search of those flowers... so I missed it. I did ask him in the car on the way home, but he said that he just needed me to prepare the meal for our small group meeting... as we'd already planned. He called me for his Day 4 and was very sweet... but you know - we talk quite a bit during the work day when we need help... so it's nothing new for him to seek to help me in areas of need. Once again, complete honesty here... I stressed about this one. Not because I thought John would be mean or anything like that - I just don't like the idea of bringing up people's faults. When I mentioned that this one might be hard... John immediately gave me one that he thinks I'd answer for him... 'the fact that he doesn't undress in one place... so there tends to be clothes all over the place' - the funny thing is that after being married for 7 and a half years... finding socks all over the house doesn't bother me anymore. It just is. When we first got married - it probably did bother me more... The only time it irritates me is when I find a pair that I missed while rounding up the laundry... you know like RIGHT when you finish all the laundry... and you turn a corner and there they are... LOVE that! Anyway, he did good with his - I'm trying not to obsess over them. He did tell me them in the car on the way home from work - and brought snacks so that I could just eat a Cheese-It when I felt the need to justify. HAHAHAHA! I've got to answer that for him today - YIKES - I really hate having to come up with things for him. And he totally won't let me use the laundry thing... but it really doesn't bother me. That is about it for our first week... I'm working on Day 6 today, and will give a report next week for how the dares are working for us. I'm telling you though - I can already tell that there are positive things working in our marriage through this... and through the other marriages in our group. I look forward to watching us all get stronger in our relationships. 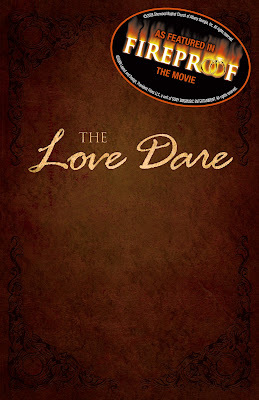 If you haven't gotten your own copy of the Love Dare - you really should. Or if you have it, but haven't really focused on using it - I really think you should... it will change your life in many ways for the better. You deserve it, your spouse deserves it, and you won't regret it! After all, next to a relationship with God - there is nothing more important than your spouse. It sounds great, Kim, and I totally get it on the laundry thing! The Brit does that to me all the time, but his specialty is clothing hanging off the footboard of the bed. If I wash them, he complains they were clean...if I leave them, it is guarenteed they will be in the hamper before bed that night! What a wonderful program! I'm so glad that this is going so well! I'll have to remember this one . . . down the line, of course!